Moe’s Southwest Grill® welcomes Atlantans to their more than 70 locations across the metro area as they proudly support Bert’s Big Adventure in the month of June! The Atlanta locations of the fast-casual southwestern restaurant are donating 10 percent of their net sales every Wednesday in June to Bert’s Big Adventure®, a nonprofit organization that provides a magical, all-expenses-paid, five-day journey to Walt Disney World® for children with chronic and terminal illnesses and their families. There are three things Moe’s newbies should know (not that there are many in Georgia): the roadies will cry “Welcome to Moe’s!®” when you walk in the door (don’t be jolted – it’s normal), the most popular burrito is lovingly called the Homewrecker, and Moe’s Famous Queso is famous for a reason. Each meal is created-to-order in a way that is as unique as the people Moe’s serves. With honestly awesome ingredients like all-natural chicken, grass-fed steak, organic tofu and handcrafted guacamole, Moe’s offers a wide variety of options to meet guests’ unique tastes and lifestyle. And no matter the meal, guests can always count on getting free chips and salsa. Moe’s Southwest Grill’s Atlanta Co-Op is a proud supporter of Bert’s Big Adventure, donating 10 percent of their net sales every Wednesday in June to the nonprofit organization. There are 70+ participating Atlanta locations, with the goal set of raising more than $85,000. When: June 7th, 14th, 21st, and 28th, from open to close. Hours of operation vary per location. Where: More than 70 Moe’s Southwest Grill locations across the metro Atlanta area. Please visit www.moes.com/find-a-moes to find a location near you. Why: Help us reach our goal of $85,000 for a great cause this year by dining at one of the 70+ metro Atlanta locations on Wednesdays in June. 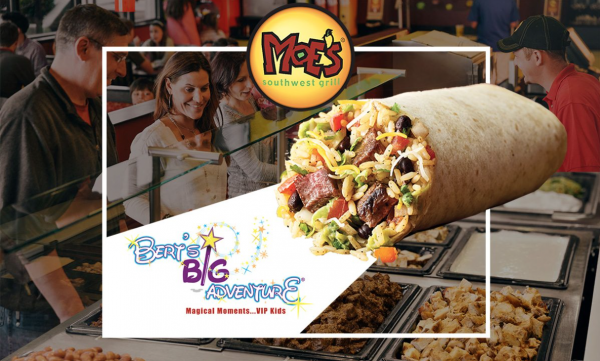 Since 2013, Moe’s Southwest Grill® has donated $250,000 to Bert’s Big Adventure.